A vampire is a humanoid creature that must drink blood to survive. They are often possessed of great beauty, and sport fangs that secrete a distinct venom that changes those bitten into vampires themselves; a creation of Death to pervert the light of the One. Vampires may share similarities with the undead, such as being cool to the touch and very pale of skin, but are still living creatures. *all statistics based on averages; extremes in any direction, or found in odd locations, are always allowed. Aging Bitten vampires freeze at whatever age they were bitten at; this can be anywhere from a simple child to an elderly individual, and anywhere in-between. However, purebred vampires (vampires that are born of vampire couplings and not from being bitten) will age normally into their adult years, by which time they will freeze anywhere between the ages of twenty-five and fifty. Divine Abilities Light, fire, solar magics, and other such 'divine' abilities are harmful to fledged and blooded vampires; those Changed that have such affinities will be unable to use them without great harm to themselves and those around them, until they are significantly old enough to use them without backlash. Purebred vampires are often unable to use these abilities at all, as they aren't born with them. Purebred Vampires A 'purebred' vampire is an individual that was born to biological vampire parents - they are born as any other, and often develop fangs and a taste for blood from toddler age on. These purebred vampires are somewhat stronger in magical ability than their Changed brethren, and do not suffer the hunger that leads to a nosferatu transformation until their teenage years. Vampire Virus Those transformed into vampires through bite undergo what is known as the Change; a transformation by which the virus attacks, takes over, and alters cells in the victim's body. This Change takes place over a handful of weeks, usually anywhere from two to ten weeks depending on the individual and what race they were when they were bitten. Humans take the shortest amount of time; lighter-based species may take significantly longer. After the transformation has begun, a bitten victim must partake in their creator's blood, or otherwise feed within the first week of the virus' hold, lest they become permanent nosferatu. Weaknesses Divine items - such as god weapons and blessed objects - may drive vampires away, and/or kill them with relative ease. Things infused with sunlight may burn on contact, and if pierced by one, a vampire of any age may burst aflame. For this reason, stakes imbued with sunfire are often carried by those who wish to destroy vampires, as well as any godly item granted by the pantheon of light. Species info credited to Blazeh, Skyeh, Shuhei, and Lypten. Appearance Vampires are humanoid creatures closely resembling the parent species they have descended from, no matter if they are born of vampire parents or Changed through bite. Any humanoid species may become a vampire, though they will all have subtle physical alterations after they are subjected to the Change - these physical traits will be carried on to any offspring a vampire may have. Often, vampires will have a more regal, charismatic appearance than their original selves; most are slender and well proportioned, though exceptions do exist. A vampire's skin tone often changes; lighter skin tones may become paler, some near chalk white, while darker skin tones may gain a greyish cast or ashen appearance. Vampires will always have sharper canines that may elongate at will or when ready to feed, though some may choose to keep longer fangs visible at all times. Otherwise, hair color, eye color, and other appearance traits are extremely variable. When a vampire has been starved of blood for any length of time, they may begin to deteriorate physically and revert back to their primordial forms before the touch of Gurthril. The first change is that of eye color - their eyes will shift to a scarlet hue, and their pupils may divert into slits. Their skin will then lose whatever remaining color it has as the hunger progresses, and their fangs will elongate as the rest of their teeth divert to sharpened points. Next, a vampire's mouth will grow into a blunt muzzle as claws tip their hands, and their ears and nose will become large and batlike. If the hunger is allowed to persist for any length of time, their hair will fall out and be replaced by rows of spikes, their arms will grow into large bat wings, and their feet will grow large talons: they will become one of the nosferatu, and be unable to assume their previous form. Culture Though vampires will generally retain their cultures and dispositions from before the Change, and some may even hide within the communities they were once a part of, many are shunned and persecuted if they're found out. 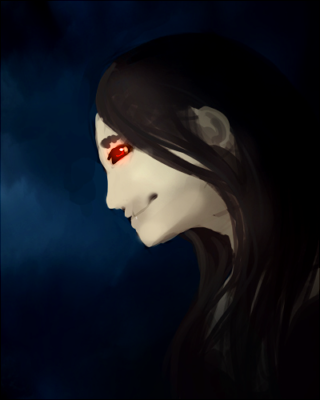 Places that accept multiple races - such as Vystriana - are kinder to vampires openly expressing who and what they are, though other countries show no mercy. Vampires are generally gifted with charisma, and older individuals may take leadership roles with ease. Some live with strict moral codes, such as refusing to drink the blood of their base race, or to never bite children or the elderly. In many cases, those bitten and Changed by a vampire may stay close to or live with that vampire for many years, before striking out on their own. The greater majority of older vampires will take up a lavish, aristocratic lifestyle, and are very loyal to protecting those beneath them. Others may use their charisma and power for much darker purposes, enslaving those around them after luring them close. Abilities A vampire's abilities will be greatly affected by age and origin. While many vampires will keep whatever affinities they had before the Change - or inherit abilities from their parents if they're purebred - all will hold the ability to gain life from the drinking of blood, and the power to transform others into a vampire through a virus, found within the venom of a vampire's fangs. This venom acts as both a localized painkiller and a catalyst for the virus to act, rapidly attacking and overtaking cells all throughout the victim's body. If the virus is allowed to run its course, a victim may be completely transformed in as little as two weeks. Fledgling: New vampires that have just completed their transformation fall into the 'fledgling' age; this is usually before they have tasted first blood, other than their creator's. These vampires have little control over their venom and hunger, and will often drain a victim completely without realizing what they're doing. They are not incredibly strong nor fast, and may be more prone to death than any other. Generally, a fledgling vampire will be so for a handful of weeks; purebred vampires are considered fledglings until they reach adolescence. Sunlight, bright light, and fire kills fledglings by burning them on contact. Blooded: Blooded vampires are those that have settled into their life as a vampire, and have not only refined their ability to drink without killing, but also to change their victims into vampires. They are fast and strong, and gifted with heavy endurance. These blooded individuals are considered thus for a handful of centuries before they are considered elders. Sunlight burns blooded vampires, but bright light and fire do not have the same killing effect. Elder: Elder vampires are centuries old; they drink sparingly, and often have a brood of their own bitten individuals - either nosferatu or otherwise - as servants that they have created. They have extreme defensive capabilities including self regeneration and skin that is very difficult to pierce. Elder vampires have enough control to drink without transmitting the virus, and may keep thralls to feed on whenever needed. Sunlight is a minor annoyance, sapping their energy, but no longer carries the ability to burn and kill. Ancient: The most powerful of vampires are the Ancients; these vampires are several thousand years old, and in addition to carrying the abilities from their previous years, may transform into a bat or group of bats at will. This transformation often takes total submission to the energies of the night, and a massive amount of reiatsu; those with weak souls cannot achieve it, and will overtax. Sunlight no longer bothers Ancients, save for those divine weapons imbued with concentrated sunfire. Creation Year: unknown. Realm of Origin: First Realm. Long ago, in the First Realm's chaotic years, Death reigned true and free; it did not take long for Death to engage in tactics involving disease and pestilence. One such product of this atrocity-filled sojourn was the creation of the vampire curse, a virus found in corrosive venom he created himself. “You shall be born of the One’s precious creatures, taken into my fold as hunters attuned to the dreaded night, cloaking yourself in shadows to steal away life. Death intoned. As you, kin of the bat, live off the blood of others, stealing their life’s fluid straight from their body’s crimson rivers, I christen you… 'vampire'. Known through the ages by many names, the vampire curse was intended to turn some of the One’s disciples away from the great entity via forcing them to commit violent atrocities to slake their thirst for blood and to stay away from the presence of sunlight, which was one of the One’s methods for granting life and vitality. The first nearly burned in the presence of the sun, and was horribly scarred, leaving him appearing monstrous. After his humanoid friends attempted to assist the afflicted creature, he suddenly thirsted - and attack them with a venomous bite. Soon, they turned as well. Those that were turned into vampires were often shunned as undead due to their behavior and appearance; this further contributed to their corruption into Death’s disciples. It should be noted that the first vampires, including the Ancient First, acted more like vaguely humanoid predatory animals - significantly more bat-like than the modern vampire, with a vaguely pig-like snout, pointed ears, beady red eyes, and constantly exposed fangs. The nosferatu resemble these earliest vampires, in both appearance and behavior. While the first generations of this virus were more like a plague, the virus became its own worst enemy. When whole communities would be turned into vampires, this resulted in the creatures simply feeding off one another, which created in-fighting and death of those afflicted. It was Gurthril, unable to stand the ungraceful and uncouth brutishness of these creatures, who modified Death's vampires and eradicated their ugliness to be replaced with refined and noble beauty. The virus was refined and the acidic qualities of the bite removed, and vampires no longer appeared as undead, filthy creatures, but things that could lure prey close with their appearance. The thirst for blood became not quite as pronounced, and vampires no longer burned in the glorious light of any Realms' suns. Then, there was the matter of the First; who remained ugly and charred, malformed and distasteful. In order to save the delicate virginity of her own untainted eyes, she restored the First’s form, and enhanced it to her standards. She weaved unto him a superhuman beauty above that of normal vampires, and granted him the finest of noble clothes. Pleased with her work, she released him upon the world, and watched him lure more than one pure lady to an early demise. Name: Strahdinlo. Location: sleeps beneath the Adiel Tower in Lizzarkyth. Status: Alive. Strahdinlo is a tall, lean vampire with pale skin and black hair. He is seductively handsome, and holds an alluring charm; his eyes are a deep, royal purple, and he often dresses to match. However, it was not always so - once, at the dawn of his creation, he was monstrous and malformed, ugly and undesirable. Gurthril changed him to be what he is now, and many - man and woman alike - have been drawn to his ethereal, divine beauty. 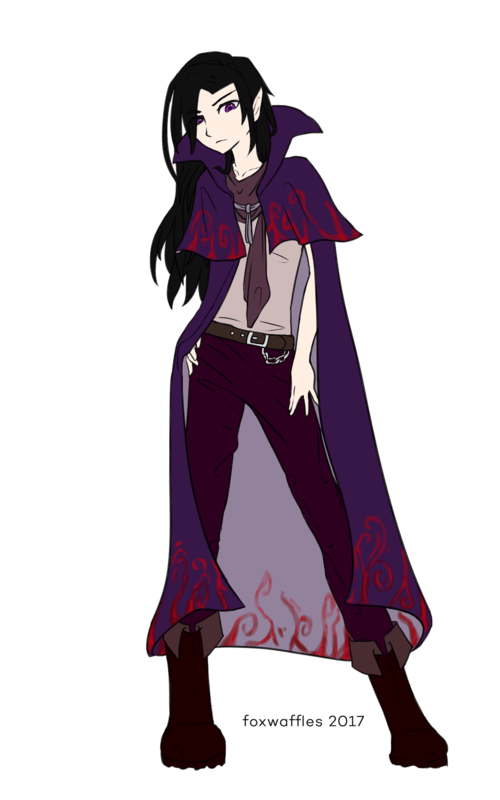 Most often, the First vampire adorns himself in brilliant shades of purples, lavendars, magentas, blacks, and silvers; he may wear extravagant jewelry or none, though almost always dons a cloak of purples and reds over whatever he may be wearing at the time. Nothing is known of this vampire's exact abilities; no scholar who's been able to get close enough has lived to record their findings. Classification: animalistic vampire. Location: abroad. Morai vampires are animalistic individuals who have been bitten by a vampire; either another morai, or a true vampire. They take much longer for the virus to manifest any transformation, and may fail frequently. Those that are successfully Changed grow long, saber-like fangs and have scarlet eyes no matter their base race, and may suffer from darker fur/scale/hide color and fading markings. They burn in sunlight for the first few hundred years of their lives; however, once old enough, sunlight no longer harbors the power to kill them. All morai are gifted with great speed, strength, and stamina; they also do not seem to scar. Classification: primordial vampire. Location: abroad. Nosferatu are a lesser vampire that appears most like those of their origins, created by Death; their shapes are vaguely humanoid, and they have a deathly pallor to their skin, often appearing greyish or greenish to the naked eye. Their arms are forged into long, batlike wings, and their hairless heads are covered in spikes. Nosferatu faces have blunt muzzles and large maws with visible, saber-like fangs; their eyes are often red, but may be found in any color, while their ears and upturned noses are distinctly batlike. Gripping talons on their feet appear to be almost birdlike, large and imposing with sharp curves and serrated inner edges. Most nosferatu are not altogether intelligent, and may be slow to grasp even simple meanings and tasks. They are completely driven by hunger and need, often to the point of savage attacks with no direction or control. Nosferatu cannot bite others and turn them into vampires; they have no venom in their fangs. These primordial vampires also do not have the speed, strength, or stamina that normal vampires do. Commonly, nosferatu are those individuals that have been bitten but don't partake in blood fast enough - or a vampire that starves for too long, ending with a permanent transformation. Classification: cursed, undead vampire. Location: abroad. The strigoi is a type of vampire cursed into a half-life long ago, and is considered a truly undead member of the vampire race. The origin of this subspecies was a vampire cursed by his victim, a worgen, into living in true undeath. To prevent the rotting of his flesh, he drank more blood than others, killing to stay alive. His descendants retain this trait. With the same strength and stamina as their cousins, the strigoi vampire is much faster, and has greater senses - but this is also a weakness, as they can't stand strong smells or direct sunlight no matter their age. Sunlight is toxic to them, and because of their intense sense of touch, they have no protection against its burning rays. They may also be killed by the alloys in various types of metal, namely silver and platinum, for they have no immunity to their toxidity. If they go any length of time without drinking blood, their bodies will begin to deteriorate, as well as their senses and powers. And unlike their cousins, because of the curse, they do not have a shadow nor a reflection. The abilities of a strigoi are varied, but all have the ability to transform into a night-creature of their choice; usually a bat, a rat or a dark-feathered owl. Some may be able to raise the dead for a few moments at a time, and others can control werewolves, worgen and wargwolves. This control is based on the hatred retained of the original worgen who cursed them, and varies in strength individual to individual.